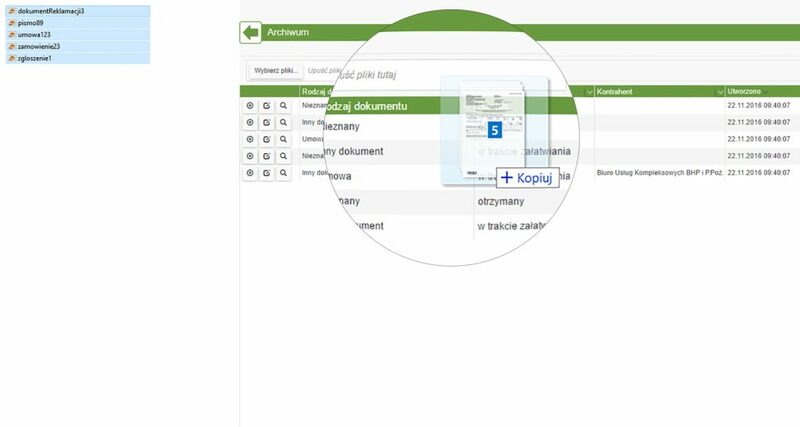 The digital office enables to record documents incoming to the company both in the paper and digital form (e-mail). Thanks to the OCR function, available soon, launched for selected documents, it will be possible to search documents according to their contents. A simple access granting mechanism facilitates the work of several persons on a document. UNISONO Flow records individual documents and documents combined with appendixes. UNISONO Flow simultaneously cooperates with many scanners via the dedicated SBM software that facilitates the scan and bar code management. UNISONO Flow recognizes the content of invoices perfectly. You do not need to draw up a template of the supplier’s invoice – UNISONO Flow will do it for you automatically. Digital documents saved on the disc can be entered in the archive by means of the ‘drag and drop’ or upload function. In UNISONO Flow you will register the incoming and outgoing correspondence/ It facilitates keeping the correspondence register. Scanning of a large number of documents is extremely simple. The system divides scanned documents to one file, recognizes bar codes and facilitates the management of appendixes. For each scanned document it is possible to switch on the function of the OCR content recognition. Thanks to this, key information can be transferred from the document to a form, along with a concise description of the document, with just one click. By determining the validity date of the document we will make the system notify us on the lack of response from the person who should read it. UNISONO Flow will watch over meeting the deadlines resulting from official letters, etc.